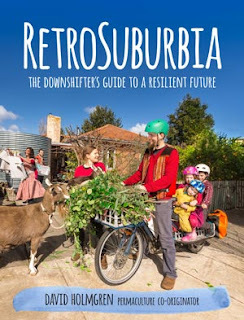 One project that has dominated my life over the past couple of years has been my involvement in the production of RetroSuburbia: the downshifter's guide to a resilient future, permaculture co-originator David Holmgren's new book. It's been a really exciting and challenging project for me, tying together the various threads of my life - with my background as a graphic artist / designer, passion for permaculture and regenerative living, desire to inspire others to make change in their lives, and development a successful ethical enterprise. Ever since I read David's essay on Retrofitting the suburbs for an energy descent future I've been nudging him to write the book. We met fortnightly for a year or so while he worked on the initial manuscript, while I developed the first incarnation of the RetroSuburbia website - which has since been upgraded and redesigned by Ostii and the team at Flowji. An important aspect I wanted to get across in this work was that RetroSuburbia isn't a pipe dream, it's happening now. We wanted case studies to demonstrate that, and Abdallah House was the first. It was set up as a template for how other properties could be shared, the Abdallah House case study became one of thirteen case studies to feature on the RetroSuburbia website. We set some impossible deadlines for the launch of the book, as the size of the project scaled up. My role grew to become the project manager, as we worked with more and more people to realise the grand vision that we had. I was reluctant to take on the role of book designer for such a huge project, and had someone in mind to take that on. When it became clear that that wasn't going to work, I put my hand up and took on the job, handing over project management to long time colleague, and RetroSuburbia text wrangler, Beck Lowe. At around the same time, the illustrator that I had been working with pulled out. But it just so happened that Brenna Quinlan was spending some time at Melliodora (David and Su's property) and was a perfect fit for the task at hand. From L–R, Richard Telford (designer, project manager), Brenna Quinlan (illustrator), David Holmgren (author, publisher), Beck Lowe (chief text wrangler, project manager), Oliver Holmgren (photographer, photo editor). Oliver Holmgren stepped up to take on the role of photographer and photo editor. His work helped bring the mish-mash of photos together with the addition of his own photos taken at various properties around the country. We worked together with Beck on the cover photo shoot at Hibi Farm, which was a lot of fun. 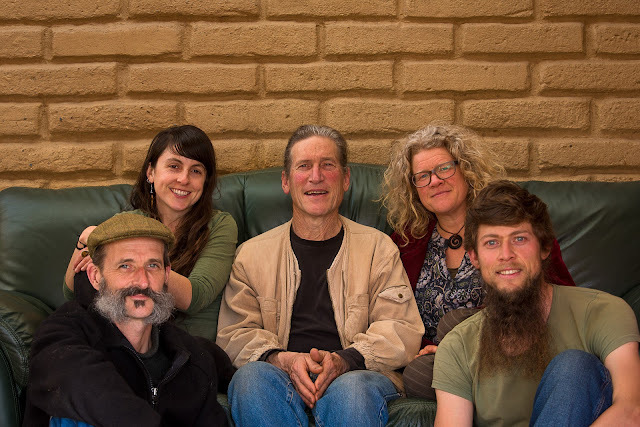 There have been a bunch of people behind the scenes making things happen, including Artist as Family star Meg Ulman and Melliodora queen, Su Dennett. The book production was probably the most intense 4 months of my working life, which was completed at summer solstice 2017. Many late nights and early mornings on the computer and countless hours in virtual meetings with David and Beck. I will never live down my off-handed remark "nothing's impossible"... what we achieved was, what I thought, impossible. 592 pages, 556 photos and over 100 watercolour illustrations. The books comes in at a hefty 1.8kg and is 40mm thick. Click on this link to hear Phil Bourne interview Beck Lowe and Richard Telford on Seymour FM's EarthChat. A crowdfunding campaign helped raise money to ensure that the book could be printed in Australia, on Australian made, FSC approved paper. It's an important way to demonstrate what the book is on about - relocalising, and supporting local business. 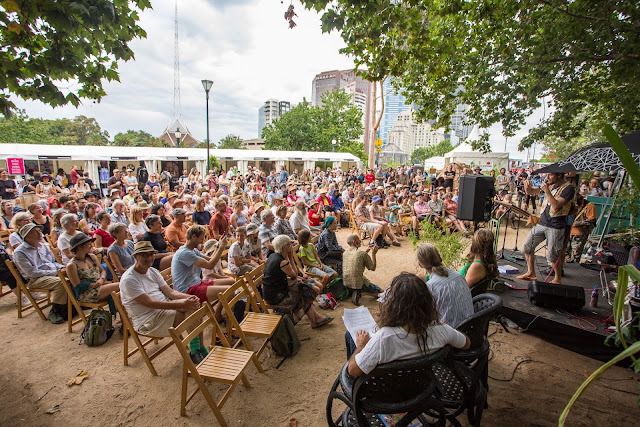 The RetroSuburbia book launch at the Sustainable Living Festival in Melbourne. Check out the photos here. Since the launch in February the work has continued, as we market and distribute the book. Business is booming, with over 1000 copies being sold in the first month. That's 2 and a half large pallets of books! Sent out from our packing shed in Seymour. We are now employing Christine to help us keep up with orders. 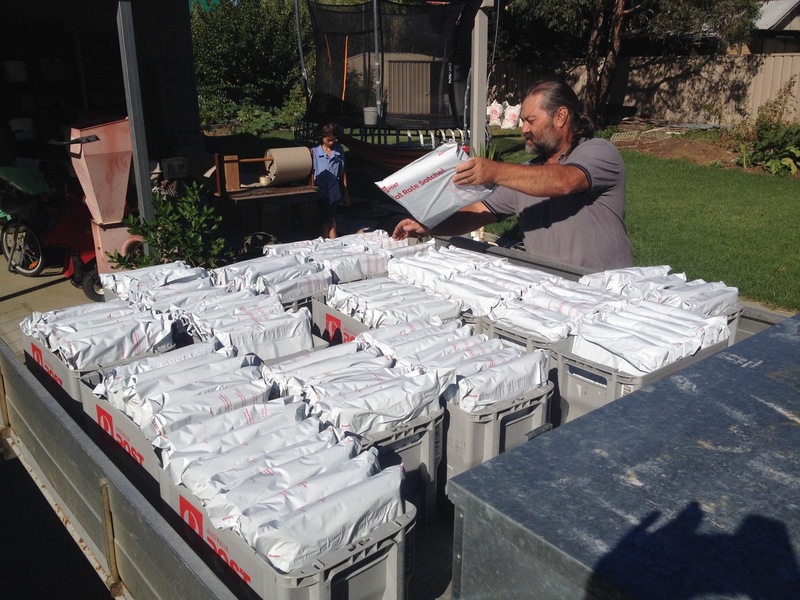 Bruce the postie picking up a single day's mailout of pre-ordered RetroSuburbia. Interest in Abdallah House has picked up since the launch of the book - which features our home in the first case study. I've been contacted by Organic Gardener magazine to share our story in the 2018 May/June edition, and by Happen Films who are in the process of making a 15 minute documentary about our place. Exciting times! 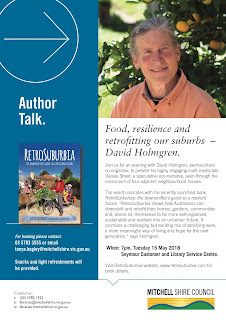 And to add to that... David Holmgren is coming to Seymour Library to present "Aussie Street". 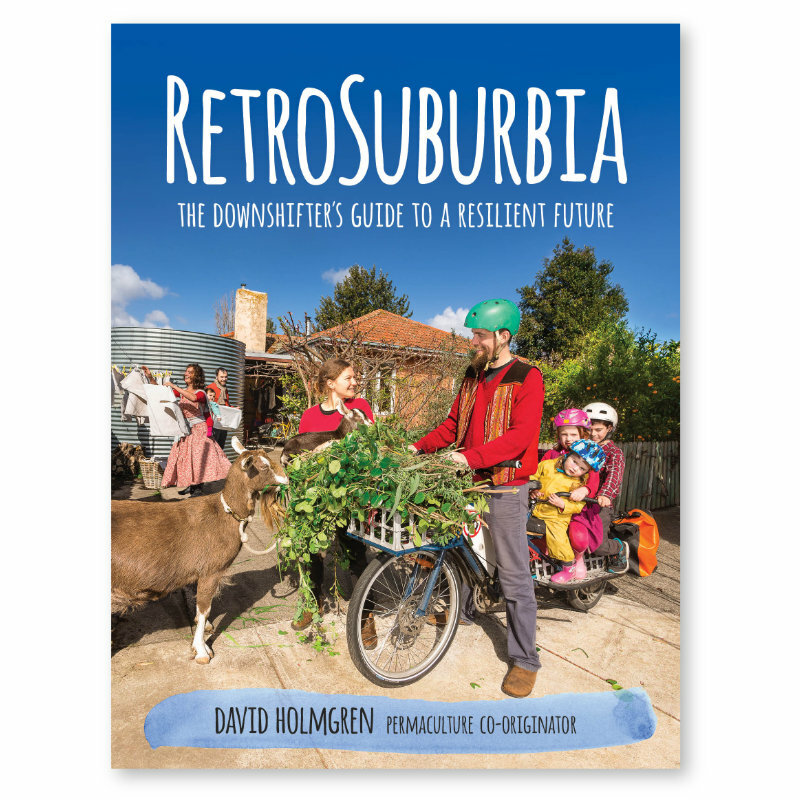 The presentation cleverly brings Holmgren’s RetroSuburbia ideas into our everyday lives, using 100+ photos and water coloured illustrations and practical concepts from his exciting new book. Come along to be part of Holmgren’s remarkably insightful, thought-provoking vision for a resilient and life enhancing sustainable future. See retrosuburbia.com/events for more details. It's a free event from 7-9pm Tuesday 15th May 2018 at The Seymour Library, 125 Anzac Ave, Seymour. Be great to see you there! Download the flyer and share it around. Stay tuned for a special extended tour of Abdallah House to follow the 'Aussie Street' presentation on Sunday the 20th of May, from 9-12.